Stay classy and read more shipping. Hello everyone, I know it's been a while. I haven't updated any of my stories in almost half a year. I feel awful about it, but there are good reasons for it. Life has been getting in the way a lot (I know you've heard that many times before), but it's true. A combination of things have been happening that have been keeping me from writing. Both good and bad things. Hey, guys. It's been a while! I haven't properly logged into the site in months, and I just wanted to apologize for that. There are good reasons, but what it boils down to is the fact that I had a brief, three or four month hiatus. Hey guys! It's been a while since I've made a blog on the site. In fact, it's been a while since I've been active on it at all. Well, that's about to change. I recently updated my story The Element of Magic, which was long overdue. To my surprise, it was actually featured for a few hours last night! I'm very happy about that, considering it's my first time. That was the last story I'd have expected to get into it. I've been writing fanfiction for about two years now. It's hard to believe it's already been that long since I sat down and decided I'd write a story based on the Soul Eater universe. I still write in that universe to this day, but for the past year I've dedicated most of my time and writing to ponies. And today, I discovered something I really can't believe. I hope you guys are excited as I am. I decided to sign up for the TwiShy group's contest so I would have the chance to win a new pony plushie. It gave me a chance to write a new one-shot, so I figured I'd do it. I'm very excited about it, as I've been slaving over it for the past week (and it's the reason I haven't updated in awhile). 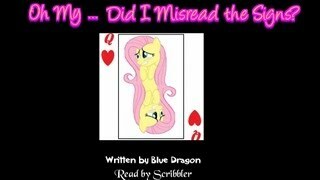 This is the first time someone's done a fanfic reading for me. Needless to say, I'm very happy today. The link's posted below, and you should all check it out. (The Fluttershy voice is amazing!) Special thanks to obabscribbler for doing it! So, I've had a mini-hiatus for the past couple of weeks, and I have a legitimate reason for that. I just moved into a new house, and had to go through the tedious process of packing, moving the boxes into a truck, unloading said boxes into the house, and then unpacking everything. Of course, because we've only just moved in, I hadn't had the chance to get online until today. You know, no internet.